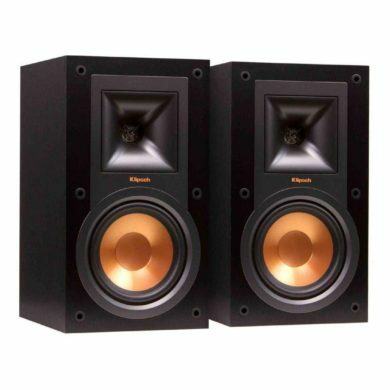 The Micca MB42 is one of the most purchased bookshelf speakers up to date. The engineers at Micca have found a way to offer great quality in terms of how the speakers sound and durability, all at an affordable price. This having been said, there are a few drawbacks to this model, such as the need for amplification. However, this is only required when connecting it to computers, laptops, or receivers. From a performance and functionality point of view, the model is not designed to be used in professional studios. This is also reflected in the price, as the speakers are more affordable than other products on the market, and apart from the need for amplification, they offer largely the same features. 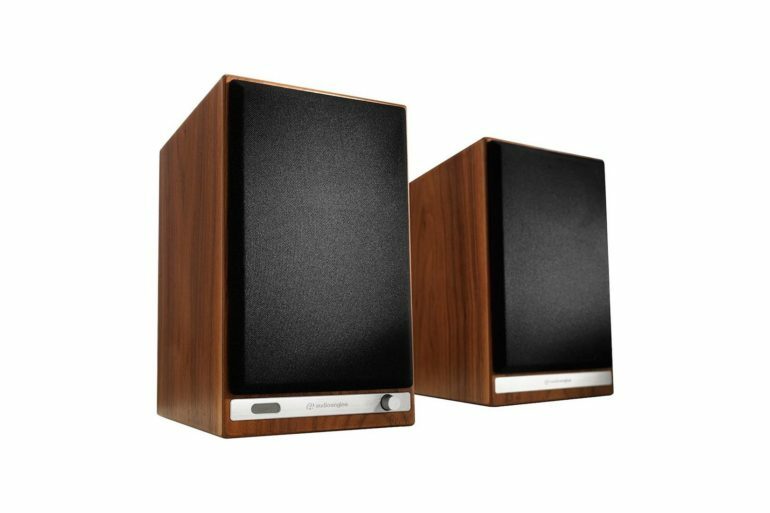 Finding good amps for these speakers isn’t difficult, and once you do, it’ll seem like you’ve gotten your hands on a high-power, premium set of bookshelf speakers that would normally come with a much larger price tag. The MB42 is for all intents and purposes the best choice for someone looking to create a great home sound entertainment system over the course of a few months, buying every part individually. It is important to keep in mind that it is always a good idea to choose products that come with features that you will constantly use. While more expensive models may be more flashy, they may not necessarily come with functionalities that are useful to everyone. In other words, there is no reason to spend a lot of money on a model that comes with a remote control if it will be used only as a desktop speaker system. The main reason behind the popularity of the MB42 is its great performance. The design simply works in terms of both aesthetics, and clarity of sound. With the right amp, these speakers could easily go head-to-head with more expensive models such as the Mackie CR Series 3. 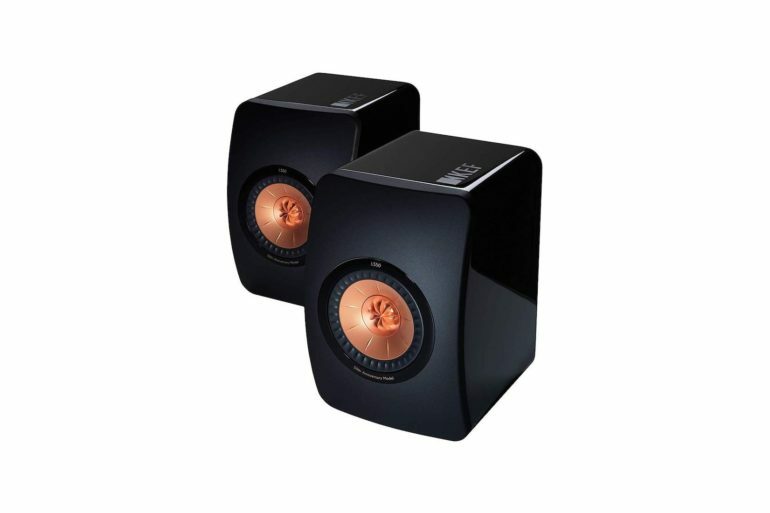 They’re small, well-built, and they can produce great sound at both high, and low frequencies. 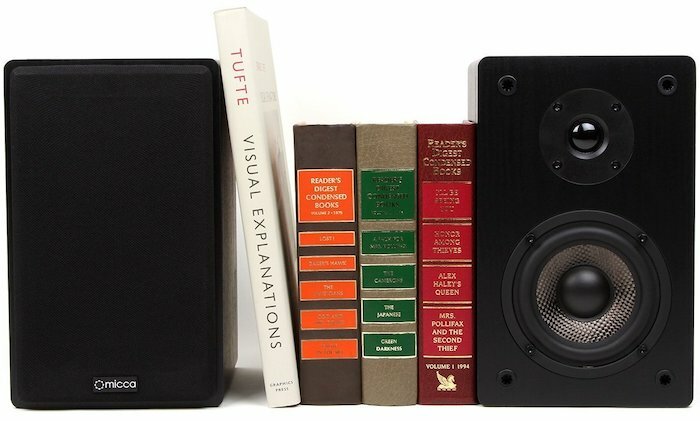 The casing of the speakers is made of wood grain vinyl and measures 9.5 x 5.8 x 6.5 inches, making them perfect for those who do not have a lot of free space, or for anyone who wants to use them as computer speakers. The 4-inch woofer is made of woven carbon fiber and is protected by a fine cloth grille. From an aesthetical point of view, the MB42 is simple, sleek, and extremely easy to match with any kind of furniture or décor. And if the speakers look too plain, take the grille off and enjoy a more industrial look. 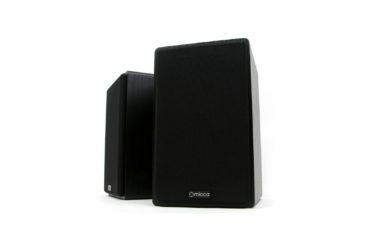 While these speakers look and perform great, especially when considering their low price, they do require an amplifier. They work great with any kind of amp, as long as it is in the limits of 6ohm-8ohm. Other than this, they can produce crystal clear sound with very deep bass. Also, the sound is not distorted even at high frequencies, and they can easily be made part of a home entertainment system. While the Micca MB42 may not have the wireless connectivity features that pricier products come with, or an integrated amplifier, its price makes the mode great for those who simply need a pair of speakers that produce crystal-clear sound and will not break the bank. This having been said, the MB42 is just as popular among professionals who would prefer to handpick all their gear rather than buy an all-in-one product. Risk-Free Home Trial – The speakers can be tried out once purchase and if they are not up to par, they can be easily returned for a refund. 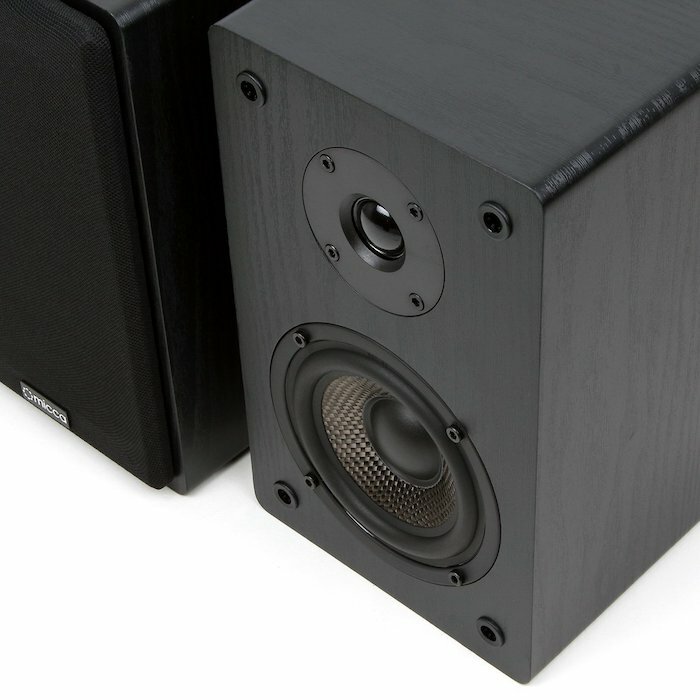 Great bass – The carbon fiber woofer creates rich bass that sounds great regardless of music genre. No quality-of-life features – The lack of an integrated amplifier is understandable considering the model’s low price, however, it could have used Bluetooth connectivity, or at least a simple remote control. There are dozens of bookshelf speakers to choose from (if in doubt, you can have a look at our selection of the best bookshelf speakers of the year), however, various models are made to cater to the needs of various people. The MB42, in particular, was designed as a budget solution for those who do not have a lot of money to spend on an audio system, or who already own an amplifier and simply need a pair of quality speakers. Many audiophiles choose to buy this model due to the low price and the ability to test them. The manufacturer’s policy is that if the product does not work as it should or is unsatisfying, buyers can simply ask for a refund without having to give any other reasons. 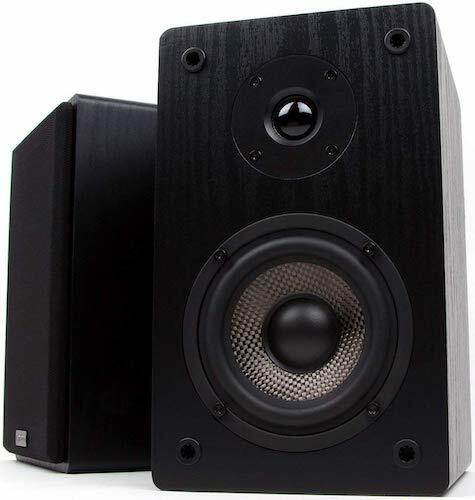 At the opposite side of the spectrum, there is the HD6 from Audioengine, which comes with many more quality of life features, or the Mackie CR3 bookshelf speakers that cater to the needs of professionals. Unlike the MB42, the HD6 has an integrated amp, wireless connectivity features that enable the owner to stream music through various apps and services, and a remote control. However, the price does reflect the added functionality. Generally speaking, the model from Audioengine is a luxury product that works right out of the box, with no additional equipment needed. Another alternative to the MB42 would be the Mackie CR3. 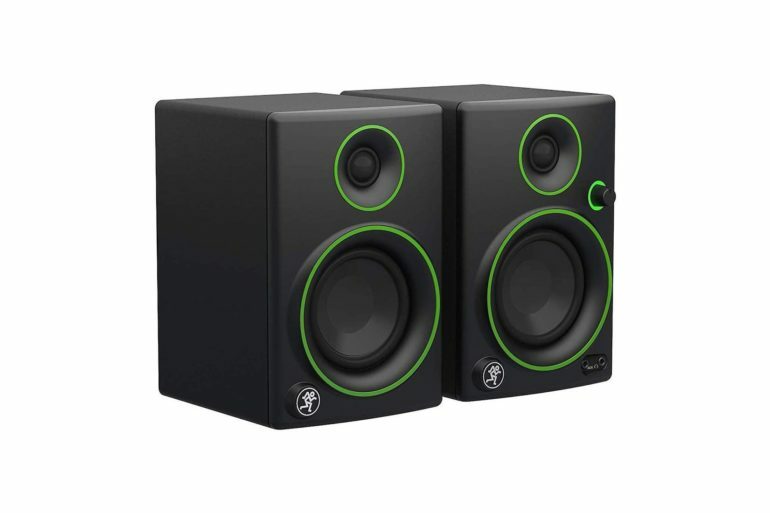 These are designed with a more modern look and more advanced components that are meant to create studio-quality sound. Similar to the HD6, this model also comes with Bluetooth connectivity features for wireless streaming. In other words, the CR3 is a performance model while the MB42 is designed for home use. Choosing the best product depends mostly on its intended use. The model from Micca is widely popular due to the fact that it offers the best bang for the buck. 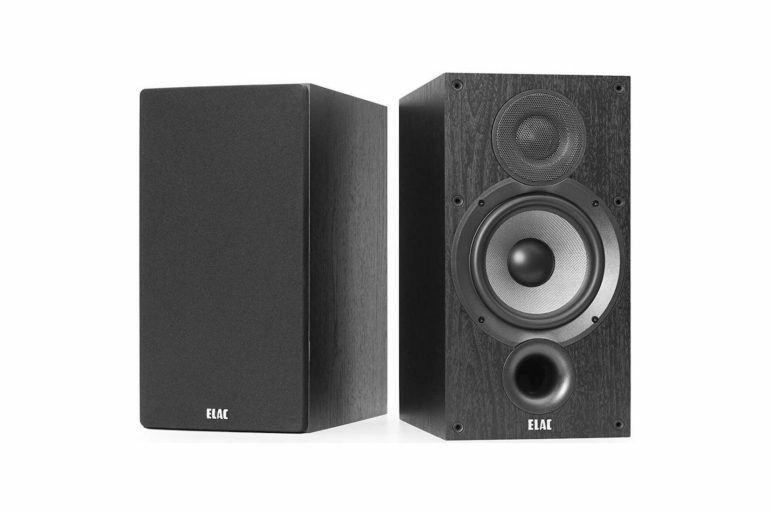 The speakers have a clean, simple design, and the components inside are designed to create the best possible sound regardless of what they are connected to, as long as they have proper amplification. The MB42 is a great choice for those who simply want to buy a good product that will last for several years and work as advertised. While it is true that the speakers require external amplification, their price makes room for an additional piece of equipment without breaking the bank. And on the plus side, this gives buyers the option of choosing the amplifier that they like the most. There may not be any wireless connectivity or remote control with this model, however, it does produce crystal clear sound and will not distort regardless of what genre of music is played through them. The speakers are affordable, they get the job done, and they look great.